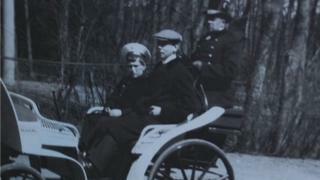 An intimate view of the doomed Russian royal family has been captured in a rarely seen collection of photographs. The images were brought back to England by Charles Sydney Gibbes - tutor to the children of Tsar Nicholas II - whose unique access to the Romanovs helped him to picture them in unguarded and informal poses. The son of a bank manager from the Yorkshire town of Rotherham, Gibbes made the decision to teach English abroad after graduating from Cambridge University. By 1908, seven years after arriving in Russia as a 25-year-old, he was tutor to the five children of Tsar Nicholas II. He would stay with the family even after the tsar was overthrown and the Romanovs were banished to Siberia. In 1918, Gibbes became one of the first foreigners to examine the scene of their execution. He would later become a priest in the Russian Orthodox church and, after returning to England, establish a chapel in Oxford. A photographic archive of his time in Russia is now kept by Charles Gibbes Paveliev, the son of George Paveliev who was adopted by Gibbes. Most of these pictures have never been seen outside the family. Mr Gibbes Paveliev said the images showed "how close he was to them, because there are some very personal photographs in his collection". "Just taken like a member of the family, not a posed photograph." A diary by Gibbes held in the Bodleian Library at Oxford University also provides insights into his time with the royal family. One entry refers to Alexei's haemophilia, the genetic blood disorder that was passed on to several members of Europe's royal families via two of Queen Victoria's daughters. One quote from the diary reads: "Alexi very poorly all evening, I read but with difficulty could he pay any attention." Outside events were beginning to be felt by Gibbes's charges, as he recorded in his diary. "Everyone very anxious about the issue of events, the Tsarevich knows nothing of passing events but feels them all the same." Poignantly, the diary entries end at the point where the Bolsheviks exiled the Imperial family to Siberia. In May 1918, the tsar and his family were moved to remote Yekaterinburg, to a residence the Bolsheviks called the House of Special Purpose. It was to be the Romanovs' final, fateful, journey. Mr Gibbes Paveliev said: "That was the last my grandfather saw any of them; he went all the way with them to their destination, but he was not allowed to enter the House of Special Purpose." Tsar Nicholas II, Tsarina Alexandra, their four daughters, Grand Duchesses Anastasia, Maria, Olga and Tatiana, and son Tsarevich Alexei - along with four royal staff members - were killed on 17 July 1918. They were lined up as if for a family photo, before a Bolshevik firing squad shot them in a hail of bullets, according to witness accounts. Those who did not die immediately were bayoneted. Gibbes's archives, also held by Mr Gibbes Paveliev, record how in the days after the executions he helped to plot bullet hole by bullet hole and, with forensic attention to detail, understand what happened in the cellar where the Romanovs were killed. "It must have been horrifying to walk into that room and see all those bullet holes, all the blood," Mr Gibbes Paveliev said. "The tsar had been the first to be shot through the head and then everybody dropped to their knees and were shot in a kneeling position." The horrors of what happened in Russia would colour the rest of Gibbes's life. He returned to Britain permanently in the 1930s, by now Father Nicholas after converting to the Russian Orthodox faith and becoming a priest. Gibbes filled a church in Oxford with mementoes and memorabilia that he had collected from his time with the Romanovs, creating a little piece of the Russia he had left behind. He died aged 87 in 1963. The story of Charles Sydney Gibbes is to be shown on BBC One's Inside Out on Monday, 12 March at 19:30 and will be available on the iPlayer after broadcast.